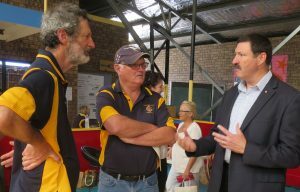 November 2017 – Narooma Rotary Club Inc.
Renewable Energy Expo coordinator Frank Eden and Narooma Rotary President Bob Aston chat with Member for Eden Monaro Dr Mike Kelly at Saturday’s Expo. The Expo was a great success. It was fabulous seeing more than 500 visitors roll through the doors on Saturday. I’m sure all visitors gained valuable information about renewable energy, recycling and waste reduction. Most exhibitors I spoke to told me that they were kept busy with questions, inquires and sales. General feedback from visitors was it was a great day, and thanks to Rotary for organising the event. Our local Federal Member Dr Mike Kelly was very impressed with the Expo and thanked Rotary for having the foresight to coordinate it. A big thank you to all exhibitors and sponsors for their generous support. The dinner and forum on Saturday night was also informative with a good turnout of Rotarians and community members to listen to highly qualified speakers. Once again thanks to Frank Eden, John Doyle, Chris O’Brien, Sandra Doyle, Angie Ulrichsen and Laurelle Pacey for their fantastic organisation of the Expo. This Thursday is our Italian night. The cost is $25.00 for a two-course meal. It should be a great night with an excellent guest speaker. Carmel Mackin will entertain us with her presentation ‘Italy from Toe to Top’. Carmel first came into contact with Italy and the Italian language over 40 years ago. However, it is only more recently that her love for both developed, via two extended trips to the land of La Dolce Vita. Last week’s guest speaker Mark Hemmingsen of Electric Vehicles Canberra was thanked by Ange Ulrichsen. International toast: Having recently returned from Alaska, Rod Walker proposed our international toast last week to one of four Rotary Club’s in Alaska’s capital Juneau – the RC of Juneau-Gastineau. It’s a breakfast Club of 45 members who meet on a Thursday. Last Thursday our guest speaker Mark Hemmingsen of Electric Vehicles Canberra, also an Expo exhibitor, focussed us on ‘all things sustainable’. He spoke of Canberra’s potential to become the electric vehicle (EV) capital of Australia, noting new developments in Canberra will have charging points for EV. He said EV’s advantages included being cheaper to run, fast and powerful, reliable, convenient (can refuel at home), required less maintenance because fewer moving parts to break, not being oil dependent and environmentally friendly. The expo got off to a good start on Saturday with people trying to get in before the official start at 10. It was soon evident we would have quite a busy day. Thanks to our trusty ‘gatekeepers’, no one got in through the door without divulging their postcode; from that we could monitor numbers plus where people were from. About 500 people came on Saturday, 87% of them were from Batemans Bay to Eden. Last year we estimated about 600 people over two days. On analysis of postcode numbers as a proportion of recorded 486 entries: Bodalla/Narooma/Bermagui 57%, Moruya/Batemans Bay 22%, Bega to Eden 8%, Yass/ACT/Queanbeyan 4%. The remaining 9% came from Shoalhaven/Illawarra, Sydney, elsewhere in NSW, Victoria, Queensland, Western Australia and South Australia. 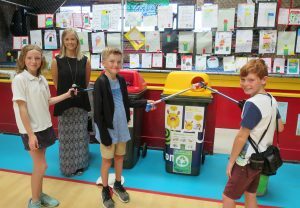 Narooma Public School students Anna Woolnough, Seb Potts and David Manning with teacher Michelle Symons demonstrated the results of a joint environmental project between school students and Narooma Rotary to reduce schoolyard rubbish, with posters outlining the results behind. Our local Federal Member Dr Mike Kelly who officially opened the Expo was very impressed with the Expo. He said the economic reasons for getting behind the push to renewable energy are ‘overwhelming’, noting ‘it’s about our children’s future’. ‘There’s great world leading stuff happening in Eden Monaro,’ he said, but lamented so much Australian-designed renewable energy technology was being taken up overseas rather than in Australia.’ He believes the Eden-Monaro area had the potential for being the flagship for Australia with renewable energy driven by grassroots’ movements. Dr Kelly also presented prizes to Narooma Public School students who won the poster competition around improved garbage bin lid designs for the school playground. This was a huge success with the kids, thanks to Sandra and teacher Michelle Symons. 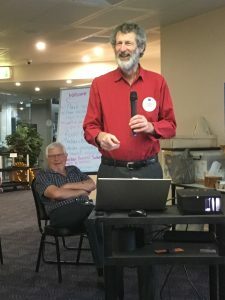 The Renewable Energy Forum at Club Narooma on Saturday night featured three expert speakers in front of about 60 people, fewer than last year. 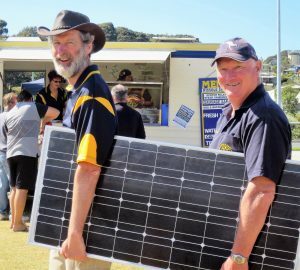 Mark Shorter of Eurobodalla Shire Council spoke of ‘these exciting times’ of an ‘energy revolution’ with homes at the heart of this revolution. Solar, he said, was the most viable renewable source in our area after going through the possibilities of each source in this area. By the end of this year, Council will have installed more than 700kW of solar power capacity at 27 council facilities. Council is investigating the potential of large scale solar farms in the shire as well as methane and biogas harvesting from Council’s landfills and sewage facilities. Kylie Hitchman from ClearSky Solar Investments said ‘there is no holding back renewable energy projects’ and that it was possible to generate 100% of our energy from renewables. She added that increased energy efficiency and energy storage were also part of the equation, and the grid was still essential. ‘We’re seeing more control of power generation at the community level often by community groups partnering with council’, and spoke about investment possibilities in projects around Australia, returning 6-10% p.a. 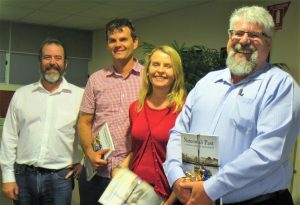 MC of the Renewable Energy Expo Forum on Saturday night David McInnes, left, with Forum speakers Mark Shorter of Eurobodalla Shire Council, Kylie Hitchman of Clear Sky Investments and Richard Kirkwood from Divall’s Earthmoving and Bulk Haulage in Goulburn. Richard Kirkwood from Divall’s Earthmoving and Bulk Haulage in Goulburn outlined his company’s commitment to sustainable practices which have minimal impact on the environment, and to solar projects including for their own business and four solar farms. The diverse arms to Divalls and how they originated were quite fascinating. Divalls employs more than 200 people full time and is the largest employer in the Goulburn area outside of the Council. Wow! I am so happy the Expo has been such a success and that’s down to everyone who helped out, including on the day. I would especially like to thank Laurelle for publicity, Rachel for her great graphic designs, Angie for her efforts with sponsors and her enthusiasm, Chris for organising the sponsors and the dinner (which was scrumptious), Sandra for her terrific Facebooking and John who acted as facilities manager. Tim Dolstra did an even better job than last year putting together an amazing promotional video. Michael took charge of the sale of the solar lights [approx $1,000 raised] and word has it that he has been offered a job by one of the exhibitors. Bob Aston kept us all in line and focussed, and delivered a very good speech or two. Finally thanks to David for some entertaining MCing. Our sponsors and exhibitors deserve special praise. Without their support we could not run the expo. 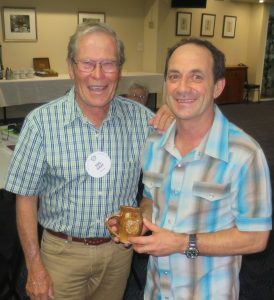 Ian Thomlinson was inducted into his old RC of Warrandyte on Tuesday night, joined by Micki. 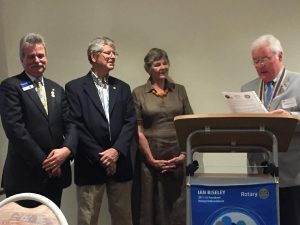 Former Narooma Rotarian Ian Thomlinson was inducted into his old Rotary Club of Warrandyte in Victoria this week, having moved back to Victoria earlier this year. Congratulations Ian. 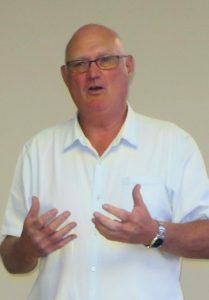 Ian is a Past President of the Rotary Club of Narooma and a former Assistant Governor and a greatly respected Club ‘statesman’. Ian and Micki always added a lot of fun to Club events (Ian’s role as the Christmas Fairy being a highlight), and they are missed by all who knew them. Another great meeting last Thursday with an excellent speaker to keep us entertained. Thanks to Trevor Neville, I can now draw a shark that looks something like the real thing! As a former teacher, Trevor’s talk impressed me because he used the art of teaching, breaking things down into easily achievable bits to teach us how to draw and create. This year’s Renewable Energy Expo is almost upon us. I am sure the Expo will provide all who attend with valuable information about reducing our reliance on fossil fuels, renewable energy and effective waste management. Frank and his committee have done a wonderful job organising the Expo; let’s hope the Eurobodalla community give it the support it deserves. Don’t forget our Italian Night on 30 November at the Golf Club. It should be a fun night with an excellent speaker. The Club needs accurate numbers to prepare our meal so please indicate your attendance at this week’s meeting. It will also be a great opportunity to invite friends along to experience one of our meetings, so if you get a chance invite a friend to join us. Also keep in mind our annual Christmas party at Casey’s on 21 December; it will be another opportunity to invite friends along to enjoy some Rotary hospitality. Mal Gray thanked our talented guest speaker Trevor Neville. Trevor showed us what amounted to a portfolio of some of his wonderfully colourful and happy illustrations, particularly those painted directly onto the windows of Engadine Library, initially for Book Week, and then eventually the windows of all libraries in Sutherland Shire. He said he gets so totally absorbed in drawing that time stops. Narooma students are currently working on some murals at the school where he hopes every student will contribute. Trevor also illustrates stories for children, mostly at schools, and runs drawing workshops for children with six booked over the summer holidays. Trevor was joined by his wife Michelle (also a teacher at Narooma Public School and the community choir conductor) and their daughter Sammy. Last week we toasted the Rotary Club of Harare in Zimbabwe while thinking of the current uncertainty in their country. It is the oldest of the seven Rotary Clubs in Harare, chartered in 1930 and was one of the first Rotary Clubs in Africa outside of South Africa. The RC of Harare meets for lunch each Thursday at the Rotary Centre in Harare. It has had many major club projects over the years including a Children’s Home and the Fairways Home for the Aged. Fourteen Moruya Rotarians and partners attended Batemans Bay Rotary’s special meeting at the Soldiers Club on Saturday night to welcome 15 Pacific Island midwives and leaders to the Eurobodalla for a weekend break during their two-week Rotary-sponsored vocational training in Canberra. It is a joint D9710, D9920 Auckland and Pacific Islands and RI venture. The midwives from Fiji, Tonga, Samoa, Cook Islands and Kirabati were undertaking leadership training in a programme designed by the University of Canberra and the College of Midwives. Moruya PP Pauline Gleeson said ‘as Rotarians we should all be super proud knowing that our organisation is helping our Pacific neighbours in the field of midwifery’. She added that at the dinner the ladies entertained them ‘with humour, singing and some pretty impressive dancing’. 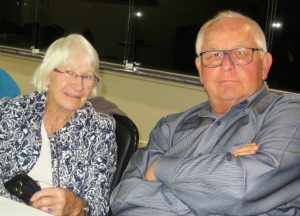 Batemans Bay Rotarians are really getting into the spirit of their relatively recent initiative of Pizza, Poetry and Plonk Nights, according to their latest newsletter. Many partners are also joining in and reciting poetry. They combined the last PPP night with a Hat theme and raised funds for Rotary Health. We’re in for a busy time this weekend what with the Expo on Saturday and the Markets on Sunday, so hopefully we will have as many hands on deck as possible AND fine weather. Last Thursday Frank Eden stepped in at short notice to talk to us about ‘AI’ or artificial intelligence. I must say when Frank told me he was going to talk about AI I thought he was going talk about something completely different! His presentation was very informative if a little scary. Frank Eden talking about AI at last week’s meeting. Peter Hartley is in the background. As I have mentioned previously, we have a busy few weeks ahead of us. Please consider volunteering for these important activities including the Expo, Markets and Carols by Candlelight. It is particularly important to get numbers for the Expo Dinner on the evening of 25 November; we need at least 30 to 40 people to make it worthwhile. Please let me know by email if you will be attending the dinner. Don’t forget our Italian Night at the Golf Club on 30 November. If would be great to see a big turnout for what should be as great night, please invite your partners, friends and even others. Rotary Day at the United Nations was on Saturday 11 November. To find out a little more about what happened on the 11th click here. Laurelle has a little more. This week we welcome Trevor Neville as our guest speaker. Trevor is a teacher, artist and illustrator­­. His many talents include children’s art workshops, cartoon drawing and vibrant chalkboard designs. Unfortunately I missed Frank’s talk on artificial intelligence (AI) which he says is ‘the most significant technological advance in his [and our!] lifetime’. What interested him particularly last week was the resulting discussion about the social implications of AI. Frank Eden and President Bob Aston are still working towards the Renewable Energy Expo on Saturday 25 November. Our Renewable Energy Expo is less than two weeks away but the committee is confident all plans are now in place. Here is the latest great film promo on the Expo, courtesy of Tim Dolstra and Frank. Here is the link. https://www.facebook.com/477955609204611/videos/526518351015003/ Please ‘like’ it, share it, comment on it, and forward it on to everyone you can think of. Five of our members represented the Club at the Drug Awareness Community Forum held by Narooma Lions last Friday and Saturday at the Golf Club. About 100 Narooma High students attended on Friday along with a number of adults particularly from Narooma’s service clubs including Michael, Angie and Sandra. Sandra, Charmaine and Chris attended on Saturday which attracted mainly representatives from the town’s various service clubs plus a few others. The Lighthouse Surgery representative spoke with students about the Teen Clinic starting at the Surgery 14 November. It is a free and confidential service where local teenagers can seek advice from a nurse on both medical and non-medical issues. On Saturday Dr Gundi Muller-Grotjan spoke about concerns caused by opiate and alcohol use in the area. Perhaps the presentation that had the greatest impact on everyone was by two women whose sons’ ICE addiction have had such a devastating effect on their respective families, with the men in prison and one of the women now having to care for her three grandchildren. The women started the ICE Support Group to help others like themselves. The women begged the students to think about their families before considering taking ICE. Sandra said the consensus from speaking with the other service groups after the forum seemed to be to look at possibly doing something to support affected families through the ICE Support Group. No doubt we will more about this. Rotary Day at the United Nations on 11 November celebrated in Geneva the two organisations’ shared vision for peace. It also highlighted the critical humanitarian activities that Rotary and the UN lead around the world. About 1,000 people attended including RI president Ian Risley and directors, Rotary Foundation trustees, other Rotarians, experts from other nongovernmental agencies, renowned humanitarians and young leaders. This year’s theme was ‘Peace: Making a Difference’. President Bob Aston launches Friends of Narooma Rotary. We had a great night last Thursday with our launch of our ‘Friends of Rotary’ Initiative, thank you to all members who helped get the initiative up and running, hopefully it will be the beginning of a new era for our Club. Laurelle has included an excellent report elsewhere in the Beacon. Organisation of the Expo is really hotting up (excuse the pun) with sponsors and exhibitors just about finalised. So far we have 23 exhibitors booked in with a couple more to be confirmed – a great effort on the part of Frank and his team. If you want to keep up to date with the latest, check out the website by clicking here. Please also remember to book in for the dinner after the Expo, we will be asking members to confirm their attendance at Thursday’s meeting. Paul Croker has cancelled his workshop that was planned for Thursday’s meeting. In his place we have been fortunate to secure the world renowned Frank Eden to address us. Following Frank’s presentation we will have our scheduled Club Assembly. On the last Thursday in November we will be having an Italian night at the Club. Hopefully it will be a fun night so please invite your friends. The cost will be $25.00 a head for 2 courses. Kim Bush, Noel Bate, Rotarian Charmaine White and Angela Miller at the launch of Friends of Narooma Rotary. We had another great Rotary night last Thursday for the launch of our ‘Friends of Narooma Rotary’ by President Bob. Bob spoke about Rotary International, how our Club related to the worldwide Rotary network, how our Club was involved in our community and why we started Friends of Narooma Rotary. 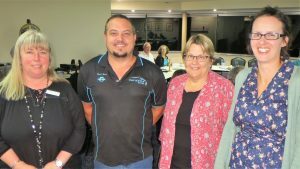 We then heard from three ‘Friends’ – Angela Miller, a teacher at Narooma Public School; Kim Bush of Eurobodalla Shire Council and Noel Bate of Narooma Motors – about how Rotary could help them and how they could help us. Angela Miller loves her job and is always looking for opportunities to offer students. She spoke about the many talented kids at Narooma school and the inspiration they give the others, like the eight Narooma students she recently took to State Athletics and of course the buskers especially the Rhythm Hunters. ‘We offer students a lot of opportunities but we are always looking for more. She is interested in exploring how they can help Rotary and how Rotary could help them. 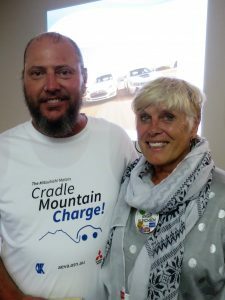 Noel Bate said his main association with Narooma Rotary has been through the car shows, and with Chris and Ange. He is interested in helping Rotary however he could. Friend of Narooma Rotary Joan Morgan and PE Rod Walker. Kim Bush is a Divisional Manager with Council responsible for children’s services, community and youth services, libraries, arts and cultural development. Her association with our Club began when she was part of the District’s Global Study Exchange team to the United Kingdom in 2006, an experience she said was ‘life changing’. Her participation was organised through Jack Wightman. She brought back many ideas, many of which she has since implemented. Charmaine thanked our speaker including the passion they showed for their jobs. It was lovely to see Joan Morgan there, another Friend of Narooma Rotary. Narooma Public School’s Rhythm Hunters wowed the crowds at the national finals of the Australian Busking Championships in Cooma on Saturday. 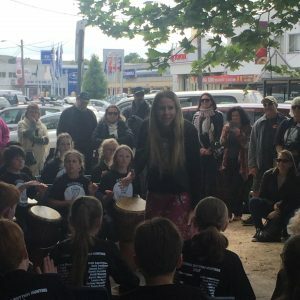 Narooma School’s talented Rhythm Hunters won the people’s choice award AND the best school group in the national finals of the Australian National Busking Championships in Cooma over the weekend. They were also runners up in the overall finals. Sandra, John and Lynda from our Busking Festival Dream Team were of course there as were several others of our winners from May, apart from the very excited 34 Rhythm Hunters’ drummers. The others were Tyler Strucklak & Skye Armstrong of Batemans Bay, Matilda Rose of Bredbo, and John and Sandra’s granddaughter Shelby Grace. ‘I am so overwhelmed with the School’s Rhythm Hunters and the opportunity and experience it has given those students,’ Sandra said. ‘It’s amazing to see how attentive they all are and how well they follow they teacher Juanita Lowe’s instructions.’ Some of the Narooma students were interviewed by Channel 9 TV. Shelby came second in the People’s Choice.